Substantial operations in Campbell County, Wyoming, primarily focused on the development of significant oil-bearing Minnelusa C Sand fields within the Powder River Basin. January-February 2011 – ECS was engaged by Trend Exploration I LLC as its exclusive financial advisor to sell all or substantially all of the Company’s assets. August-December 2010 – ECS completed its diligence, prepared a virtual data room and worked with the 3rd party engineer to finalize the reserve report. January-February 2011 – ECS conducted a narrow, focused marketing effort, contacting a limited number of strategic and financial buyers. Substantial Commitment for Focused Plan – Six groups advanced to the last round while four submitted final bids. Strong Buyer Interest – In addition to an attractive buy-in valuation for Le Norman’s contributed assets, management received an incentive structure which earns the team a sizeable ownership stake after a series of reasonable return hurdles. 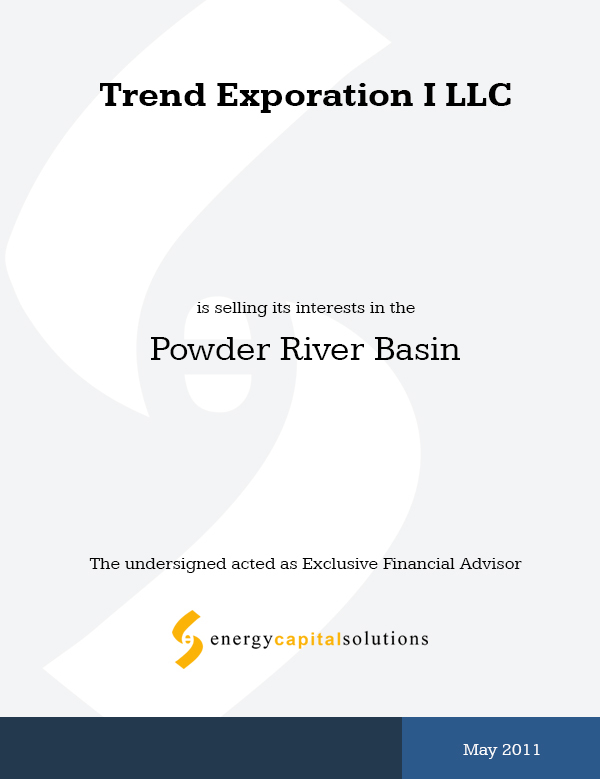 Strong Valuation – Final bids were in line with comparable transactions for conventional oil production in the Powder River Basin.